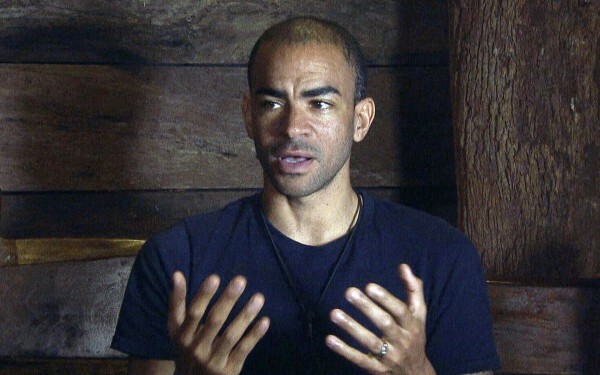 Kieron Dyer will face a room full of bloody, fly-infested entrails as he takes part in the latest Bushtucker Trial on I’m A Celebrity… Get Me Out Of Here! The new trial is called Scarier 52, and is based on Scarier 51 – the one that Lady Colin Campbell previously refused to consider. Judging by Kieron’s reaction to the smell, it’s possible the meat has been rotting away since Lady C was supposed to do the trial last week. Kieron will have to make his way through a ‘top secret military base’ to complete the challenge. In the ‘alien storage room’, he is watched over by a model alien as he scrambles through the entrails looking for two stars. “That’s disgusting, it’s gone through my nose into my mouth… horrific. It’s worse than dog s**t,” he tells show hosts Ant and Dec.
I’m A Celebrity screens at 8.30pm on ITV.